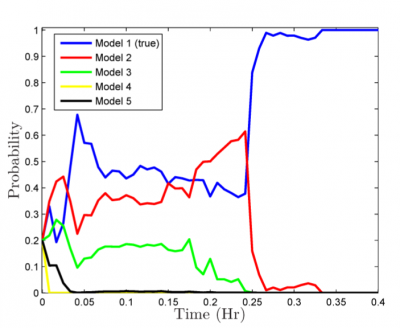 A new method is discussed, based on an unsupervised learning state variable method that uses a multiple-model adaptive estimation approach to determine the most probable shape and other intrinsic features of a space object in orbit among a number of candidate models while simultaneously recovering the observed resident space object’s inertial orientation and trajectory. Multiple-model adaptive estimation uses a parallel bank of filters to provide multiple space object state estimates, where each filter is purposefully dependent on a mutually unique resident space object model. Estimates on the conditional probability of each model given the available measurements are provided from the multiple-model adaptive estimation approach. Each filter employs the Unscented (or Sigma-Point) estimation approach, reducing passively-collected electro-optical data to infer the unknown state vector comprised of the space object inertial-to-body orientation, position and their respective temporal rates. Each hypothesized model results in a different observed optical cross-sectional area. The effect of solar radiation pressure may be recovered from accurate angles-data alone, if the collected measurements span a sufficiently long period of time so as to make the non-conservative mismodeling effects noticeable. However, for relatively short data arcs, this effect is weak and thus the temporal brightness of the resident space object can be used in concert with the angles data to exploit the fused sensitivity to both space object characteristics and associated trajectory, the very same ones which drive the non-conservative dynamic effects. Recovering these characteristics and trajectories with sufficient accuracy is shown in this proposal, where the characteristics are inherent in unique space object models. The objectives of this work are to research and develop methods of detecting, tracking, characterizing, and discriminating space objects (RSOs) to support Space Control and Space Situational Awareness (SSA), which requires the tracking, identifying, and predicting of future intentions, actions, and positions of RSOs with known accuracy and precision. To meet these objectives advanced estimation strategies, i.e. multiple model adaptive estimation, will be employed to reduce astrometric and photometric data simultaneously to recover the orbital and physical characteristics for one or more RSOs. Initially, simulated data for a cluster of controlled spacecraft will be used to prove the concepts, with increasingly more realistic scenarios being developed. Actual optical observational data (astrometry and multi-band temporal photometry) will be utilized to test the utility of these techniques in estimating (recovering) RSO orbit and physical states in near-real time. This work plan leverages a high value data set of multi-band temporal photometry collected as part of GEO cluster characterization campaign that will be used in the research outlined in this proposal. As the techniques mature, uncontrolled RSOs (i.e. near-GEO debris) will be simulated and observed. Preliminary results for shape estimation of the approach are shown in Ref. . For the development of the measured light curve data a six-faceted RSO is used. Five shapes are tested in a multiple hypothesis approach to assess the performance of the method. 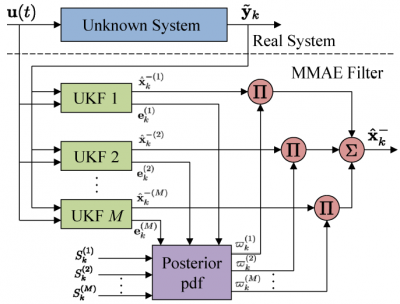 Results from the MMAE solution are shown in Figure 2. The solution shows that the approach is viable by identifying the correct shape. This provides a basis for optimism but much more work needs to be done. This includes: 1) using more complex shape models in the shape model bank, 2) incorporating a generalized MMAE  approach to obtain faster convergence rates, 3) using multiband data to improve performance, and 4) extend the work to assess the observability of estimating other intrinsic properties, such as the spacecraft material properties.